In my last post (which you can find here), I wrote about my love of galvanized metal and my success with aging some of my bright, shiny new pieces using vinegar. Today, I’m going to write about the failures. Here’s what I started with on the day of the de-shining: eight new containers (all picked up at thrift stores and garage sales) that I wanted to dull the finish on to give them a vintage, timeworn look. I misted the pieces with vinegar and tried to continue turning and remisting them (for even coverage) for about 15 minutes. Then I rinsed them in water. I was working outside because, well, if you’ve ever smelled vinegar, you know why. Most of the pieces (five of the eight), turned out perfectly. The shine was gone, leaving a beautiful flat finish. But a few of the containers, including the two pictured above, were virtually unchanged after their vinegar bath. So I decided to move onto the hard stuff with them. Toilet boil cleaner: It’s not just for toilet bowls anymore. It’s also good for de-shining your galvanized metal. Or so I’ve heard. According to the label, The Works is a mixture of 9.5 percent Hydrogen Chloride and 90.5 percent other ingredients. I’m no chemist, but I’m guessing it’s the Hydrogen Chloride that knocks the shine off of metal. Unless the “other ingredients” are Atrazine, Napalm and/or Hexavalent Chromium. Either way, I figured toilet bowl cleaner had to be more powerful than vinegar. I spread the cleaner onto the still-shiny containers. And then — and this might be where I went wrong — I went inside to start supper. The plan was to come back outside to turn and recoat the containers in a couple minutes. But I may have gotten distracted and left a few too many minutes tick by before I got back outside. The good news is when I checked on the pieces again, the shiny coating was gone. The bad news is that the containers also had weird shiny stripes and rust spots on them. At this point, I wasn’t sure if the shiny stripes were caused by that area being “underbaked” (so the shiny coating was still there) or “overbaked” (so not only the shiny coating but also the flat layer beneath it had been stripped off). Hoping it was the former, I spread more cleaner on the stripes. Turns out, that was a mistake. Almost immediately, I could see the weird stripes spreading and more rust spots developing. I rinsed the cleaner off as quickly as I could, but the damage was done. “When life gives you lemons, paint over them,” I always say. So I sanded off as much of the rust as I could and raided my basement for supplies to whip up a quick batch of chalk paint. But first I finished making supper. I added about a half a cup of “other ingredients” (i.e. leftover white latex paint) to the Plaster of Paris/water mixture. Then I painted the containers, inside and out. The chalk paint took a few coats to cover, but it dried quickly, so I just kept moving from one container to another until everything was covered. When all was said and done, here’s what I had: five (there’s a small bucket inside the beverage tub that you can’t see) beautifully de-shined containers and three that were painted white. I used regular acrylic craft paint for the stencils. In case you were wondering about the significance of the 0 and the 3, there is none. I just liked how the numbers looked. To protect the paint, I sprayed a couple coats of matte polyurathane onto the containers. When I was finally done with the de-shining/painting/stenciling/polyurathaning process, I carried my supplies into the house and set them all on the kitchen counter. Then I called it a day and went up to bed. I have a soft spot for galvanized metal. I think because it reminds me of my childhood on the family farm. We always had stacks of 10-quart galvanized pails that we kept in the vestibule connecting our milkhouse and our barn that were used mostly when feeding our calves. Our cows drank out of a galvanized tank when they were outside. Our chickens ate out of galvanized feeders. 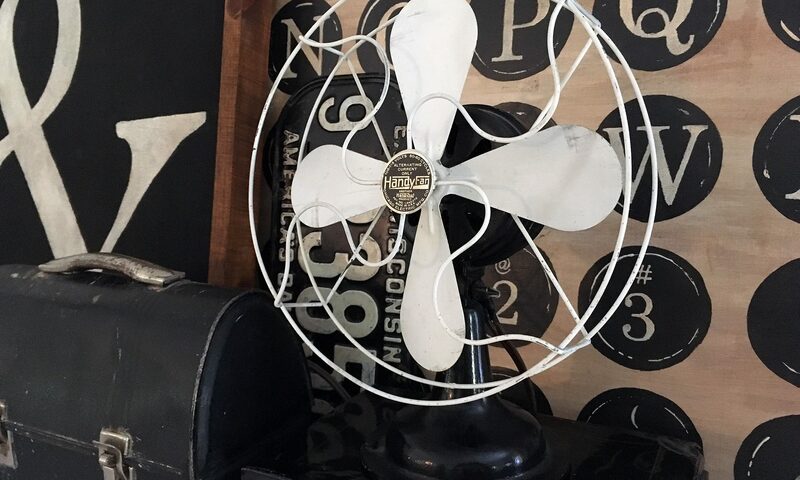 As galvanized metal became popular in home decor over the last few years, I started buying pieces to use around my house. This frame is one of my favorite galvanized pieces, just because it’s a little unusual. I also have a lot of galvanized containers that I use to hold plants and gardening tools. Virtually all of the galvanized pieces I own were bought secondhand for a couple dollars or less. Some, like my watering can, are vintage. But most of the pieces I’ve picked up are relatively new. Sometimes the new pieces are a little too bright and shiny for my liking, so I was thrilled to learn that other bloggers had discovered a remedy for that: vinegar. Following in my blogging brethrens’/sisters’ footsteps, I decided to give the vinegar trick a try on some of my too-shiny pieces. I put vinegar in a spray bottle and misted it onto the metal. Then I tried to keep re-misting and rotating the pieces around for even coverage over the course of about 15 minutes. When I was done, I rinsed everything with water. The process was a little stinky, but I have to say, it worked, as you can see by the before and after shots of my once-shiny new beverage tub. It also knocked the shine off the top of this small bucket — and cleaned up the white limescale buildup on the bottom of it. Here’s another “before” shot of a vase. And here’s the much-improved “after” (with some of my pretty pink peonies in it). Unfortunately, not all of my results were perfect. But that, too, is another story. And I’ll save that one for a separate post.